Coming to a mailbox near you (assuming you're a subscriber), this stallion is on its way for the 100th time since 1992. 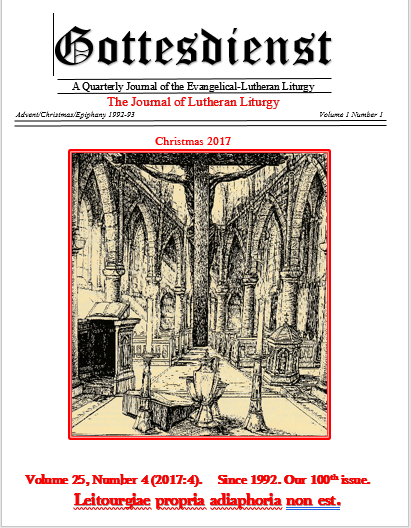 Twenty-five years ago, the first issue of Gottesdienst was published inauspiciously with an unknown artist’s crude and simple rendering of a church from the altar’s point of view, as if to suggest that worship is primarily a matter of receiving the gifts God graciously gives to his people, rather than the other way around. There is an inherent, if not intentional, ambiguity in the German term for worship: Gottes + dienst, God’s service; this journal has always sought to emphasize the gifts that Christ gives to his Church in worship. This image graced the cover of the journal for its first four years. The Trinity 1996 issue (Vol. 4 No. 2) began to employ the phrase Leitourgia Divina Adiaphora non est, lit., The Divine liturgy is not adiaphora (indifferent things). A slight alteration of the phrase is offered beginning with this 100th issue, as an attempt to clarify our meaning: Leitourgiae propria adiaphoria non est, lit., Indifference is not characteristic of the liturgy.